The only good non-compliant is one leaving the immediate area of a belt at 2+km/s. Well done. I myself dusted off the ol' cynabal a while back. It's still as fun as ever! Where do I find catalyst fits as a new knight? What are the measurements for DJEntropy's rectal orifice? Mostly correct, but Dryson forgot two things, my dead cat aaaaand a poison ivy branch. That's a really great gesture, Malcolm. Surprised to learn you were one of the fallen; surprised and genuinely disappointed. You have been someone whose comments I always held in great regard and read with real interest.. They were chock-full of good solid common sense. The best of luck in whatever you decide to do. I shall have to investigate this Orthrus. It looks like a particularly effective bumping vessel, not to discount Agent Kalorned's considerable skill. Last I checked Retrievers are still everywhere. And Eve is experiencing deflation due to ever more mining. So ya, CODE is kinda a fail. So why are a New Order shareholder? You bought it as a fallback so later you can say you were a James 315 supporter all along. False, I certainly never gave any isk to the code harassers. I oppose Code and think it should disband. More mining would cause inflation not deflation Veers. I am not allied with anybody. I go where I get paid, simple as that. It just so happens everybody in AG seems to be dirt poor since CODE pays well. And thanks for the correction. Not all of us that play EVE use English as our first language. I will continue my pointless wardecs while you continue your pointless forum posts further alienating not only people that just think your ideas are terrible, but the very same people in the Anti-Ganking channel. If I may make a suggestion, if your so against bumping or ganking why not actively go after people? People might take you a bit more serious (Yes even the clowns in AG might take you serious) if you actually tried to do something instead of just asking CCP to step in. How should I respond to Mr. Kane? Well, other than pointing out that "serious" should be "seriously." Didn't DJ used to make the exact same error? Uh oh, do you guys think Kane is an alt of DJ? And I do follow the EULA. Always have, always will. And yet here you denied being banned. "Still here, just logged in a second ago to update a contest and move some things around. Sorry to disappoint you! It's well known that I have always played by the rules and followed the EULA. I hear some people got banned today, but I am sure things will work out just fine :)"
Sorry I don't have any drama for you." So where your lying then or are you lying now? Perhaps a break from Eve to help you get a grip on reality, and to stop lying, would be helpful. Veers Tears are the sweetest tears. rofl Veers feels he has the right or need to know the status of my EVE accounts. Yes, despite denying it earlier, he got banned. Last actions in Forum / EvE 10.9.2014. "I have plenty of alts still in game shooting miners, and you're not even close :)"
lez say CODE. has 300 members. Lez say lots of alts is aroung 5. 300 / 5 = 60 People behind it. OK, just a rough guess, but we do remember the AT? royalmoron himself commited, that they were not able to muster uo 12 (twelfe) fighters. The lame excuse "we were busy enforcing the code" says basically the same. codies are a sorry little bunch, trying to make a lot of noise. Apologies for any misunderstandings. 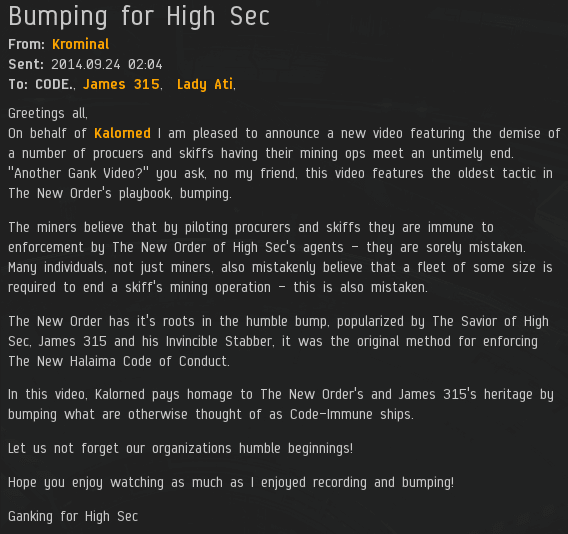 I'm actually a big fan of yours, and appreciate the work you do in making highsec corps justify their continued existence. Your continued victories in the face of overwhelming odds are quite impressive. And you are correct that many of the AG folks are lame crybabies, I certainly have no affiliation with them. My forum posts are clear, concise, and easily understood. I will continue to make them, whether you, or anyone else for that matter, approves. I believe that a robust exchange of views is essential to the proper functioning of a modern democracy. As far as going after bumping and ganking, since my view is that the game mechanics are broken, it makes no sense for me to spend my time trying to combat people exploiting said broken mechanics. My time is better spend on the Eve Forums advocating for positive change. Also, it's "seriously" not "serious." I'd like to bury the hatchet between us. I'm a big fan of yours, and I would hate for you to harbor any ill will towards me. I hereby offer you an unconditional and permanent peace treaty between our two organizations, so that we can work together to better the Eve Universe. The true Savior of Highsec"
rofl i'm sure Kane is very concerned about your activities and that a "peace treaty" with you would be of some benefit to him whatsoever. You really need to get a hold of your USI issues, dude. Yes, as opposed to the real life harassment you engaged in that got you permabanned....I wonder which of us needs a shrink, eh? If idling in a channel is defined as harassment in your book, then it is you that needs to see the shrink. Also CCP, needs to see the shrink. Veers Belvar, one day in the future the actions taken by CCP against the player base to permaband by association may be used against you. Who knows, CCP may get even more dreconian aginst the player base. Only time will tell. Veers be afraid, very afraid of what ccp can do. Why should us who are righteous fear banning by CCP? We have no fear (never to fear) as they're right to ban you code sociopaths (always right to ban, banning) if you got banned you deserved it for being a psychopath ganker tear collector (deserved every bit of ban) yes every bit (all bannings) If you were banned then it was a righteous ban (to say that it was right, wrong - RIGHT!) CCP is always right to ban code. It will only take a GM to decide veers/dyson that you are associated with something that deems you getting a ban from a GM. Then it will be you banned. With no recourse on your part. Thats the dangerous path CCP are taking. And its not just code players that have received bans. I'm a PvE player, we don't get banned. "My forum posts are clear, concise, and easily understood." Consider the hatchet buried. I honestly have no issues with anybody in the game. I play EVE the way I play since it works best for the time I got to actually play EVE. Free ISK, No grinding, and constant wars when I am actually in my own country to play EVE works well and enjoyable. On another note thank you for being a fan and please stop correcting my spelling. I am not english and I am not typing up a proposal so I really do not care for grammar or spelling. Truth be told, I really do not like the way bumping works either but i also do not see a quick fix for that no matter how good the proposal might be. I think it a very big game changer coding wise which is why I do not see anything happening soon. I think the best thing is to post a consise and clear idea in the Feature forums and not GD. But don't dictate how it should work, describe the issue and ask what can be be done to make an improvement. I got many wardec Ideas to make thing better but I want to wait and see where CCP is going come December with another big feature release. Since I might be looking at finally dissapearing into a WH with a large group or join a Null/Low Alliance like Rook&Kings. But that depends, as long as I am not dictated to how I must play we will see. Actual miner bumping on minerbumping? I thought that died out when the testosterone junkies took over and decided to blow stuff up instead. Nice to see that someone has some actual sense. rofl keep guessing. I have plenty of alts still in game shooting miners, and you're not even close :)"
So DJames315, it is allowed to consider, that you have more EvE Alts than actual underwear!! Confirming that I own far more paids of underwear then alts in EVE online. Veers I just remembered your epic fail suggestion that bumping ships should bring on a concord response because somehow in your demented world you think the two are the same thing... I was just wondering if you still hold that belief? I never suggested a "CONCORD response." What i did suggest is that once CONCORD is on scene ships should be able to warp off for 60 seconds unaffected by bumping. Holy crap that is worse then i first thought... Any catalyst on field would be able to claim it got bumped and would be free to warp off before concord locked it down. no, once CONCORD arrives the gankers get scrammed and cant warp off - bumping is irrelevant. But how would concord know who is a ganker and who is not? and how would concord determine that the freighter did not bump the ganker? huh? The point is that CONCORD would show up and scram the criminals. Everyone else could warp off unaffected by bumping. Where is vengaza when you need him. Let me clear this up for you. Let's say there's 40 billion ISK worth of ships floating in a POS, but you don't know the PW so you can't steal them easily. Here's what you do: you have an alt summon Concord, Concord makes it so that you can no-clip through all barriers with magic, you get into the POS with enough pilots, and steal all the ships. Now does Veers's suggestion make sense? Veers, the real point is that your suggestion is so wrong how can anyone take you seriously if that's the best you can come up with for a problem you fabricated yourself. Anonymous, the real point is that when you use so many pronouns in a discussion with Veers, the other Veers, Beers, and 6 anonymous posters; no one has any idea wtf you are trying to say. I’m commenting after reading much of the blog and almost all of the comments for the past few months. Agents of the New Order seem to have an absolute mastery of self-control in the face of vile and disgusting remarks from bot-aspirant players and the AG community in general. I’ve seen agents in local chat and they always maintained complete professionalism when conversing with local or a specific pilot. On the other hand, the multitude of local pilots that get involved in the conversation almost always instantly degrade to a level of swearing and personal insults. The amount of ISK that supporters are donating. The New Order obviously has a large following and players that support their cause via donations to continue the work. I’ve looked on the AG web site and they don’t seem to have any comparable apparatus in place like James 315 has setup to support MineBumping.com. MineBumping with an eloquently written manifesto clearly illustrates a vision for highsec that lays out the dangers of continued bot-aspirant behavior for all EVE players. Reading comments from the anti-CODE posters in here and the AG Blog it is clear that they have no interest in the future of EVE. They almost always resort to disgusting or vile rhetoric and offer no real educational benefit to the bot-aspirant and newer players of EVE. Personally I hope EVE players in general listen to the advice that is freely given on proper tanking and being aware of their surroundings. Sounds like very good advice dispensed by MineBumping and the Agents. 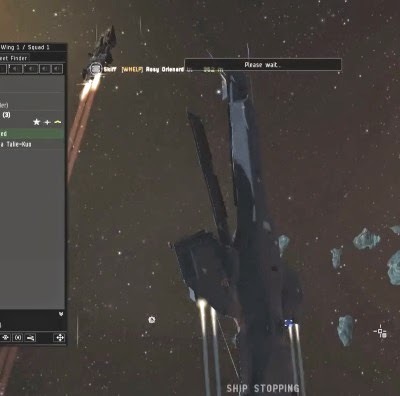 For the AG Community, maybe CCP in their crusade to level the playing field will introduce a high slot factional “petition” module that you may overheat to file useless petitions faster with. Insanity requires the most suave of emotions.